Antwerp’s Queen Elisabeth Hall and Congress Centre has been undergoing a major two-phase transformation, which was first hatched back in 2009. 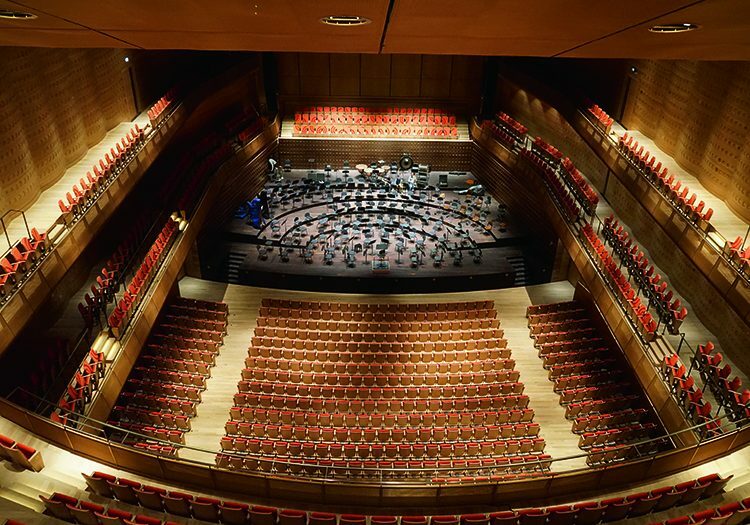 The City’s desire to create a modern multifunctional concert venue incorporating a spacious congress facility brought with it the requirement for an expertly engineered sound system – and this was entrusted to FACE, the Belgian distributors for Powersoft. As the new venue was designed to become Europe’s most ‘silent’ concert facility, acoustically optimised by Kierkegaard, choice of the speaker system was critical as Steven Kemland explained. “It had to be non-powered,” he confirmed, “self-powered active speakers, lighting or switches with fans were not an option, either in the main venue or surrounding rooms.” They chose a FOH combination of Renkus-Heinz VARIAi flown array clusters to achieve optimal coverage. With the stage tailor-made for the Philharmonic, and divided in three moving stage elements, FACE had to install 26 customised versions of the RH CFX41 stairstep speakers in the three rows, following throughout the EASE model and simulations for the optimum placement of speakers. On the stage, FACE have turned to Martin Audio for monitoring – with all main speaker and monitor sets powered by three Powersoft X8 and three X4 from the new flagship series, while an Ottcanali amplifier, featuring a switching device designed by FACE, serve the front fill speakers – with all amplifiers carrying Dante onboard. Processed by the Powersoft Armonía software, with internal DSP and Matrix onboard, this amplifier platform allowed the integration of a very complex set-up to be operated with an extremely user-friendly interface. In addition to the FOH system, FACE also installed a discreet speech system to be used with the FOH front-fill and delay speakers. The venue is also equipped with an Ampetronic hearing loop system, split into five independent zones.